Most of the Earth is covered by glaciers, even close to the equator. There is a substantial amount of sea ice. Glaciations cause extinctions and the vacated ecological niches are filled with new species during the warmer periods. The first animals, early sponges, evolve. At Cryogenian period 850–635 million years ago Rodinia-supercontinent was breaking down and the Earth was very cold. Our planet was almost entirely covered by glaciers. 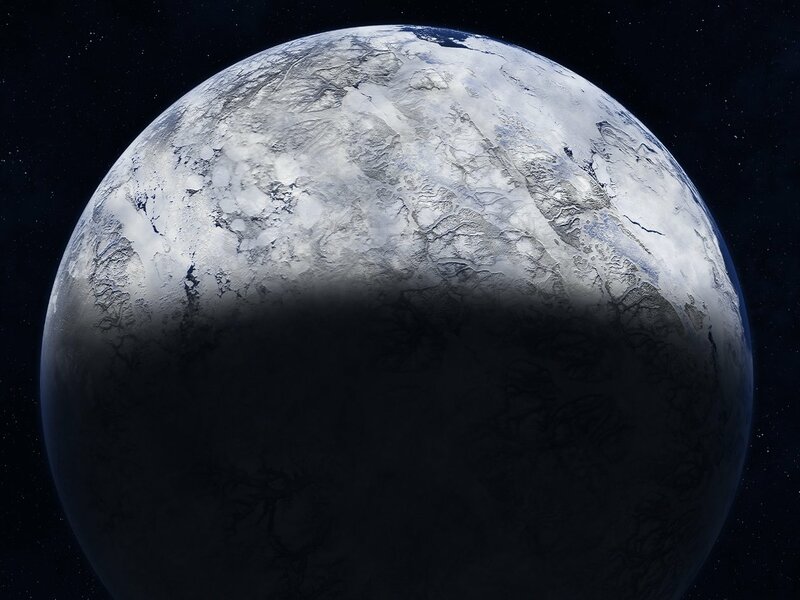 This stage is sometimes called the Snowball Earth, or Slushball, if the equator was free from ice. Cooling climate and glaciations might have initiated by continental movements and the lack of volcanic activity. Wide glaciers reflected efficiently suns radiation back to space, and cold climate started to enforce itself. The end of glaciations might have been related to the continental movements and to the release of methane from equatorial permafrost. There was also liquid water available at the iceplanet. Scientists are disagreeing, whether equator was free from ice. Also ash could have darkened the ice and these darker areas could have been warmed and melted by the sun. Naturally also deep oceans would have stayd liquid. Liquid water allowed life, including multicellular eukaryotes, to survive the harsh climate. First animals evolved probably at Cryogenian. 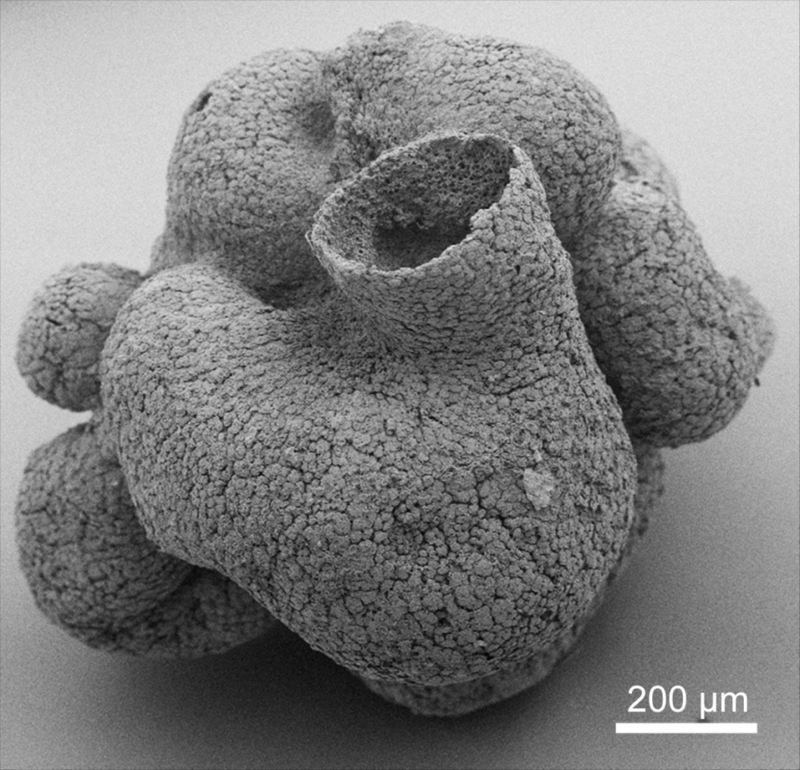 Oldest microscopic sponge fossiles are 650 million years old and in some genetic analyses significantly earlier timings have been suggested. Some scientists have suggested that the challenging conditions at the iceplanet would have driven the altruistic cooperation between choanoflagellates, which would have resulted multicellularity and developement of first animals. Also other explanations have been suggested. For example oxygen concentration was rising and glaciers affected the nutrient cycles. Early sponge fossil. This fossile is from Ediacaran, 600 million years ago, but scientists have found evidence from sponges also from the Cryogenian. Image: Yin, Z, Zhu, M, Davidson, E.H, Bottjer, D.J, Zhao, F. & Tafforeau, P. (2015). PNAS, 112(12), E1453-E1460.